One of my new favorite websites is "This is why you're fat." At first I enjoyed the site to see the horrible food that people eat. Then I began to hear myself saying, "I could totally eat that" to some of the items. Although not cupcake related, these "Elvis Donuts" sure do look tasty. 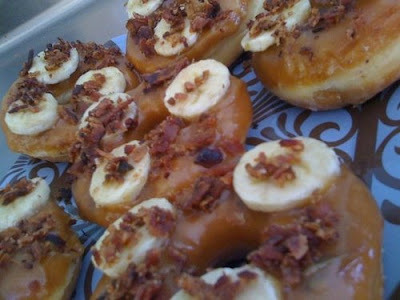 Description: Peanut butter glazed donut topped with bananas and bacon.